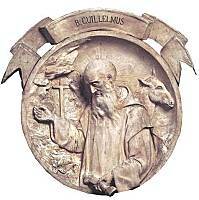 William was a Carthusian lay-brother at the Charterhouse of Casularum in Lombardy. According to legend he is said to have torn off the leg of a donkey to ward off hostile villagers after which he reattached the leg to the donkey with no ill effects to the animal. Thus he is often depicted in iconography with a donkey. He died around 1205 and was thought of as a thaumatruge. His cult was approved in 1860.